Welcome! I am Dimitra of Dimitra Designs. My whole life has been preparation to my destiny which is the Dimitra Designs brand. I started out small- working from home with one of kind custom designs until I had enough clientele to open a store. I have been in business for over 30 years and I believe part of that reason is because I take my time when selecting someone to represent my brand. Many of my loyal customers have worked with me from selecting their pageant dresses to their wedding gowns, and everything in between! Their daughters became pageant girls who grew up to brides, who now have daughters beginning their journey in the pageant/prom world. Creating that family atmosphere is important me. Meet my staff who will assist me in welcoming you as your become a part of our Legacy. Jessica was born in Mississippi and moved to Atlanta at the age of 5. 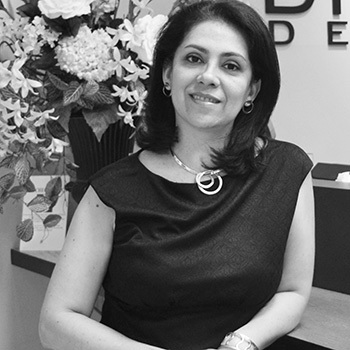 Her family settled in Greenville in 2001 and she has worked with Dimitra since 2004. 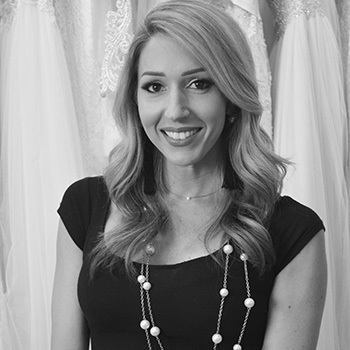 Jessica, having a servant’s heart, loves giving a joyful bridal experience to each bride she helps. Creating the whole “look” for the bride is what she does best! Aside from being a Senior Bridal Consultant, she has had the pleasure of singing at some her brides’ weddings. She is a lover of dogs, babies, and dancing. Jasmine is also from Atlanta, GA moving here in 2001 at the age of 15. She has been working with brides since 2005 and recently got married. Jasmine never meets a stranger. She has a very happy and bubbly personality. You will experience true southern hospitality with every encounter you have with her. She is a shining light here at Dimitra Designs. Jasmine is a fan of 80’s movies, loves playing vintage video games, loves to cook, and draw in her spare time. 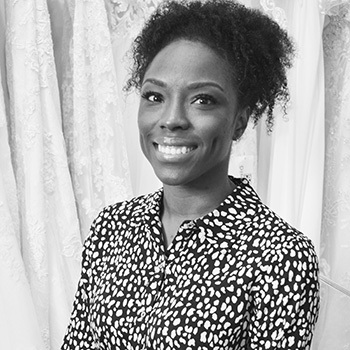 Jasmine’s main concern is developing a relationship with each and every bride. Patricia is from Medellin, Colombia and has lived in the states for over 20 years. She has been in sales ever since she started working. Dimitra met Ms. Patricia during the time that her mother was working as a seamstress in the store. Dimitra fell in love with Ms. Patricia’s positive energy and knew that those good vibes would be important when working with brides. Patricia loves everything about health, food, and holistic healing. Her goal when meeting brides is to find the dress of her dreams that beautifully embraces her figure. She loves for them to feel like the most beautiful bride in the world while feeling comfortable and confident. “I always listen to every detail about the wedding because every detail counts towards my goal of finding my bride’s dream dress. I enjoy working here”. Natalie is from Long Island, NY and went to business school in Maine. While in college, she began a modeling career that led her to Florida. She moved to Greenville, SC in 2010 working in retail management where she specialized in makeup and beauty. After working as a top seller for Zales’ Jewelers, Natalie’s excitement for helping facilitate happy engagements brought her to Dimitra Designs. Natalie eats, sleeps, and breathes FITNESS, FASHION, and the LORD. 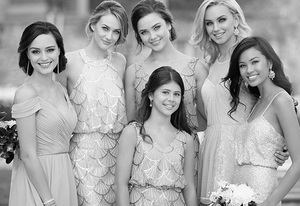 Natalie wants each bride to find what is flattering and fashionable, yet authentic to them. She loves creating the complete package for the bride and her wedding party. “It’s personal, so I want them to feel that finding the dress is just as memorable as their wedding day. I hope that each client turns into a lasting friendship”. Her name is Ms. Kim, but we call her Ms. Magic. She is a native of Greenville, SC and a mother of three beautiful girls. Ms. Kim has over 25 years of experience in the pageant industry at both State and National levels. Over the years she has participated as a pageant mom, consumer, consultant, and coach. Ms. Kim was introduced to Dimitra when she was searching for a custom pageant dress, and they have been like sisters ever since! She is also the neatest and most organized person in the store. Don’t come to her house making a mess or you will surely get put out (LOL). Come in and check out her trophy cabinet that features some of her winning clients. “They call me Ms. Magic because I can look at a girl and know what size she is and what dress she will win in”. “My top priorities are trust and dependability. If the bride is confident in me and our connection, then she will trust me to help her plan her whole bridal party, which is more of a treat for me”. Susan was born in Fairfax, Virginia. Susan began working with Dimitra during her senior year of high school. She is currently finishing up her studies at North Greenville University in hopes to become a Spanish teacher. Susan loves to go hiking, paint, do missionary work, and cheer for Clemson football (sorry not sorry). Susan has a knack for making each customer feel special. She truly cares to meet everyone’s expectations, many times going out of her way to provide those essential details needed to tie everything together. “I feel awesome knowing that my contributions will ensure a pleasant experience”. “Working with the groom and groomsmen is like putting the final touches on the bride’s dream day”. Kimdra and Kensley have grown up here at Dimitra Designs. Starting out as dress hangers, everyone at Dimitra Designs quickly realized that were also born with the “gift of magic”. Their style is undeniable! They have personally worked with Dimitra to pick out the best prom gowns off the runway. Their perceptiveness and knowledge of current trends when choosing new styles guarantee our store is stocked with must have-styles. 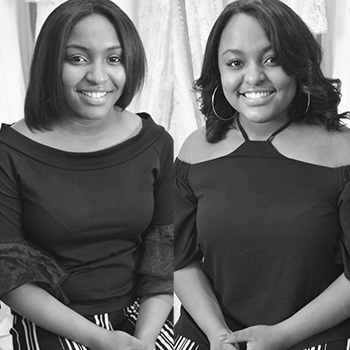 The twins only recently graduated from Woodmont High School, but they have already developed a successful fashion career as merchandise buyers for Dimitra Designs. Come let them style you this prom season! 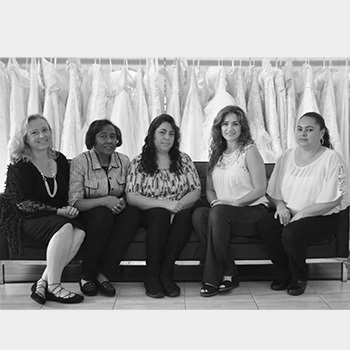 Dimitra takes great pride in selecting each seamstress based off their skillset and experience. Our highly qualified seamstresses take their time to execute each detail imagined by the bride. These trusted individuals can take the gown of your imaginations and make it a reality. Nicole is from Anderson, SC. She has an undergraduate degree from Lander University and is currently working on her master’s degree at Anderson University. She is a very family-oriented person who enjoys movies and loves to keep up with the latest pop culture. Nicole also loves fashion and arts and crafts. She is all about business! 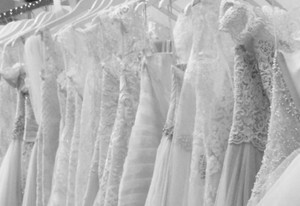 Nicole’s job is to make sure that each detail that the bride communicated with the consultants is conveyed in their wedding gown, bridesmaids order, and special occasion gowns. Nicole is an organized and detail-orientated worker. She checks, double checks, and often triple checks each order because once the gowns are ordered, there’s no going back! Monica is native of Medellin, Colombia and moved to Montana in 1999 after marrying her soulmate. Later in 2008, the sweet couple moved their family of four to Spartanburg, SC. Monica comes from a work background as an international trader for Treasury Department for 14 years. After focusing her schedule around the busy lives of her husband and two children, life brought her here to Dimitra Designs. She is a very kind and humble individual, who gets along with everyone. Her uplifting spirit creates a great balance for the store. Ashlie is from Powdersville, SC, and is currently pursuing a Marketing degree at Clemson University. She loves to sing, play piano, go hiking, and enjoys reading. Her dog, Tobias, is never far behind. Ashlie has many years of Customer Service experience and goes the extra mile in helping customers enjoy their experience. She can always be found with a big smile and positive energy. Diana is from Medellin, Colombia. She moved here in 2004 and started working with Dimitra in 2006. She has a wonderful son who is the love of her life. She takes her job very seriously but is the jokester in the office. Diana finished her schooling with a degree in graphic design. She later decided to pursue a master’s degree in marketing and international business. Diana is a very organized and determined worker. Her ability to see the final product of a project before it even begins, truly makes her a great blessing to the business.